Reddit is well known for its interesting AMA (Ask Me Anything) interviews — it reached a high in 2012 when Obama participated in an AMA on the site and subsequently has seen colorful characters including Bill Gates and Snoop Dogg Lion (twice). 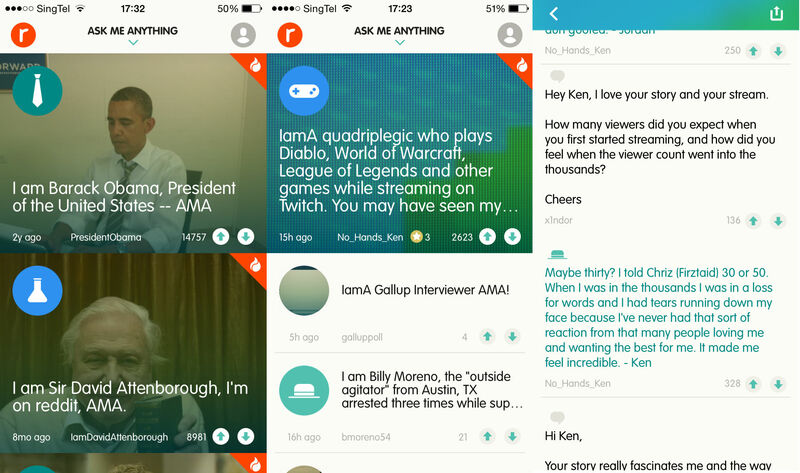 The Reddit AMA app has a clean layout and is simple to use. You can toggle between hot, recent or all-time popular AMAs and a list will show up accordingly. Clicking into a specific AMA gives you a short description of who is being interviewed, after which you can scroll down to questions that have been asked and answered, or questions that have been asked but haven’t received any reply. Ellen Pao, senior VP at Reddit, tells Variety that it’s time the company wants to be more “proactive and grow” instead of relying on organic growth — and the AMA app is a first step towards that. In 2013, Reddit served an impressive 56 billion page views and 731 million unique visitors. It also saw 40.855 million posts, received 404.6 million comments, and enjoyed over 6.7 billion total votes during the year. Comparing that to 2012 numbers, Reddit saw a 51.35 percent increase in page views, an 82.75 percent jump in unique visitors, a 36.18 percent gain in posts, and a 67.5 rise in total votes.